$30 Gift Card included for future purchase. $99.00 of free extras with purchase! Eureka lives up to their namesake with another inspired grinder—the Atom! Instead of focusing on speed, (though it's quite fast) consistency, (though it has fantastic espresso distribution) or ease of use (though it is, in fact, easy) Eureka has shifted focus into making a truly quiet grinder. This is the grinder for a house of light sleepers, apartment complexes or romantic cafés. Short of a hand grinder or a hiding place in the garage, you'll be hard-pressed to find a quieter espresso grinder on the market. 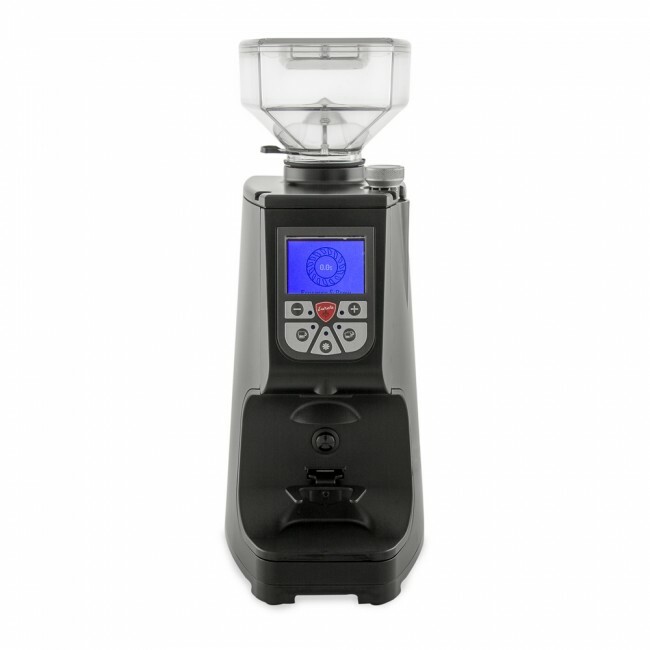 This marked dedication to sound insulation pairs with fine stepless grind controls, time-based dosing and an easy-cleaning design shared with other Eureka-designed grinders. 60mm Flat Burrs - Large burrs make short work of pulverizing beans into a uniform distribution. Sound Insulation - A metal case and a design dedicated to quiet motor and burr sounds make the Atom a great choice for quiet spaces. Timer Based Dosing - Set grind times for both single or double shots. Removable Bean Hopper - Boxy like the rest of the grinder, the Atom's hopper is easily removable for cleaning and maintenance. 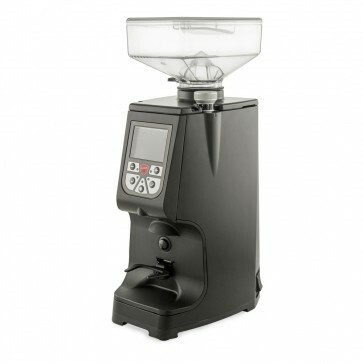 Manual Pulse Grind - Grind on demand with a dedicated pulse brew button or the portafilter button. Portafilter or Basket - The Atom comes with a dedicated grounds bin for drip or pour over preparations. 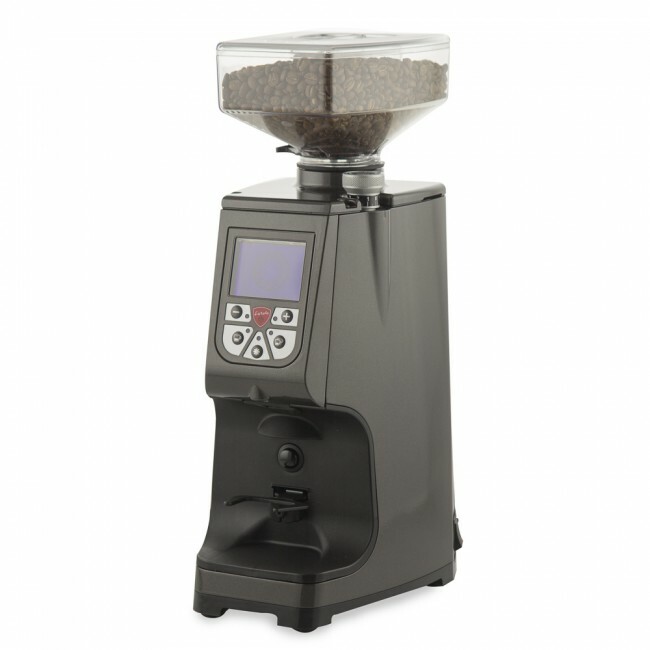 Stepless Adjustment - With nearly infinite burr settings, the Atom offers fine control over grind size. Digital Screen - An easy-to-read digital screen makes set up and control even easier. Removable Top Burr - The top burr of the Atom is easily removable for cleaning and maintenance. Bottom Burr Adjust - Adjustments happen at the lower burr, so your grind setting will be saved after cleaning. Eerie - After a while, you get used to the sound of torquey motors and spinning burrs. It is honestly disconcerting that the loudest thing about this grinder is the sound of beans moving in the hopper. Grounds Container - The included grinds container fits perfectly and makes the Atom more suited to drip or pour over methods. Quick Shots - We clocked the grind time for an 18-gram double shot in at 4.5 seconds. 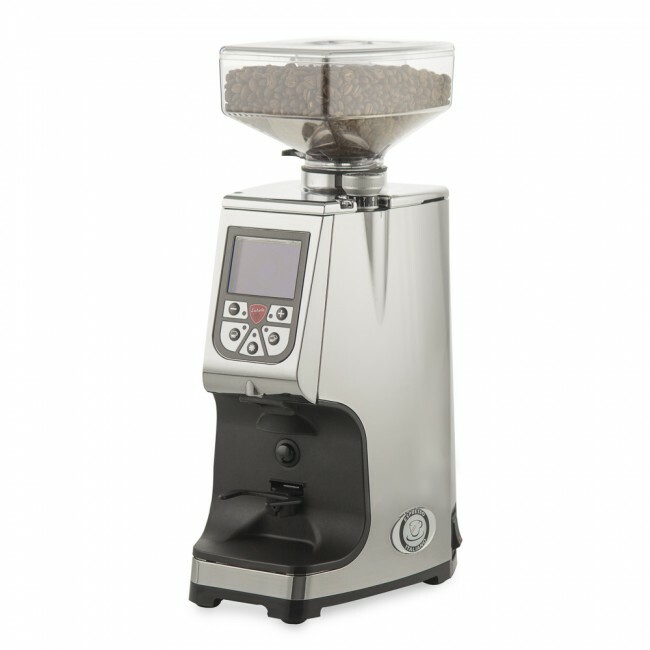 Handsome - The squared off shape of the grinder case and hopper look great next to most machines. Portafilter Rest - While the portafilter arm did a fine job with our tester Rocket's portafilter, it's short shape doesn't work as well for odd-sized portafilters. Stepless - While the extra accuracy is a welcome inclusion (especially for espresso) stepless setups are particularly ill-suited for switching between brew methods. If you're looking for a grinder for multiple uses, a stepped option will likely be a better fit. While handily capable of grinding for drip and pour over methods, the Atom gets quite messy at coarser settings. Serious power and a quiet design makes this grinder one of our top choices for home espresso (as long as you have the room). It would also be a great pick for a small cafe as a secondary grinder. Who Supports the Warranty: Seattle Coffee Gear, read more about Seattle Coffee Gear's Warranty coverage. Wipe out bean hopper between coffee refills to clean out excess oils. Brush away stray grounds from around the coffee chute daily. Remove top burr for monthly cleaning.